Little did supermarket tycoon Jim Treacy realise back in the late 1990s when he established the Castle Hume course in Enniskillen that it would be the starting point for a 10-year, £30 million golf project that would reach a dramatic conclusion with the opening of the Lough Erne course in the summer of 2009. Think of luxury golf resorts in Ireland with both excellent accommodation and quality courses and the likes of Adare Manor, Mount Juliet, The K Club, Druids Glen and Carton House spring to mind – well, to that illustrious quintet of top notch establishments can now be added Treacy’s new 5-star Lough Erne in County Fermanagh. Designed by Nick Faldo, the Lough Erne championship course extends to just over 7,000 yards from the back tees and it lies at the heart of an upmarket development in a part of the country more renowned for its angling and water sports than golf. That perception will change once golfers get to know how good the facilities are at a course that sits on a spectacular site along the shores of Lough Erne – indeed, many seasoned observers anticipate the course will be a future professional tournament venue as it has all the attributes expected of a top European Tour track. Castle Hume Lough and its many wetland areas come into play at most of the holes here so accuracy around the course is absolutely essential in order to score well. A good short game will also help at the handful of par threes on the scorecard, the last of which is played at the final hole, “Cygnets Rest,” where the home green is a welcome refuge for tee shots that avoid sand to the left and water to the right. A couple of short par fours really catch the eye. The 2nd hole, “Forest Drive,” doglegs right from the edge of the Lough and the 351-yard 10th sweeps to a green jutting out into the water. A pair of par fives are also worthy of special mention. The first, the 637-yard 9th is a strategic three-shotter that plays to a narrow, angled green and the other is the 16th, “Faldo Turn,” which enjoys views over the estate that are simply stunning. The competitive side of Lough Erne was initiated by a charity match in July 2009 between Ireland’s two leading golfers, Padraig Harrington and Rory McIlroy, when they played an 18-hole stroke play head-to-head match billed as “The Duel on the Lough.” Young Rory edged out 2-time Open Champion Padraig by two shots to claim the specially commissioned Belleek Trophy for the first time. This latest visit was my third to Lough Erne, it’s a gorgeous place to relax and stay if you’re visiting the region. On my first visit a few years ago, I played in mid-Summer and the course blew me away. It’s a nicely routed layout played in several small loops, snaking its way back and forth across a spit of land between loughs Erne and Castlehulme in what is an undeniably picturesque setting. A raised wooden footbridge takes you across the wetlands and reeds before the first five holes wind their way pleasantly around some evergreen woodland. After a testing par three over a small lake you’re faced with a climb to the only hole that’s prominently elevated above all others, but it’s worth the trek since the 6th is my pick of the holes across the eighteen. The 6th is a par five played along the top of the hill in between loughs with a semi blind uphill approach to the green from which you get some marvellous views. The elevation of the next few holes dip and rise thereafter, this time around the perimeter of Lough Erne with the signage on the 7th tee boasting that Rory McIlroy was the first golfer to ever drive the green. At almost 400 yards with water along the right hand stretch of the hole, this is something close to a superhuman feat. The 9th hole is a little marmite, a blind tee shot tightly hugs the shore of the lough where, unless you’re happy with leaving yourself a 170-yard iron into the green, there is only the smallest slither of a fairway area to land your second shot. Despite its failings though, I still like the hole. The 10th is the signature hole at Lough Erne and features the first of two cape holes, the other being the 17th where the island greens are built from reclaimed land. The pace slows a little through the next few holes as the routing inevitably has to return inland before the last three holes present a block-buster finish over and around the waters of Castlehulme Lough where a watery grave is never far away. Now that I’ve played the course on three different occasions at different times of the year, I’ve become less enamoured by the course than I was on my first visit as it does come across a little manufactured and unnatural in parts. The widow’s peak style bunkers, clover-like in their appearance also aren’t quite to my tastes and the fairway conditions can play very soft. The location of this course between two wetlands is hardly ideal turf for golf and maybe should have been sand capped, but ultimately there’s no denying the beauty of the setting or some of the golf holes. I’d recommend anyone to make the visit to Lough Erne once, particularly if you’re combining it with an overnight stay as the hotel is wonderful, the course just lacks the complexity and nuance to make it continue to be enjoyed to the same extent on repeat visits. 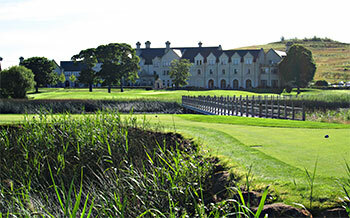 Having read some mixed course reviews, I was not expecting too much from Lough Erne. But this course is just fantastic. It is challenging but 'fair' - so long as you choose the right tees - and the setting is stunning. Course conditions were excellent. The bunkering is very well done, shots over, or near water are rarely overly penal, with the possible the exception of the 17th (NB I played in the middle of a heat wave and with the greens not holding much at all). Just a note on some of the common criticisms: It is true that it's parkland in an area where there are amazing links courses to be played. But I think it rivals excellent parkland courses I have played by Coore and Crenshaw, Nicklaus, Norman, Baker-Finch, Charles Hugh Alison and even Donald Ross. The routing means a bit of a walk, but still, carts are not a necessity as they are on many North American courses. I can imagine it might be less fun when windy, cold and wet. It is a bit of a drive from Belfast or Dublin, but if you are nearby, well worth a stop. For golfing traditionalists who prefer links to inland courses, the buggy golf experience at Lough Erne will always be something of a hard sell, no matter how good the resort is. A recent favourable review from Brian Ward alleviated any concerns I may have had in advance of playing here as he’s a man of great golfing experience around the British Isles who knows a good course when he sees one and so I was expecting to play a decent track – what I wasn’t ready for was just how good The Faldo Championship course is! I expected the playing corridors to be rather flat in aspect around the lakes, where many of the holes would be laid out around houses or other buildings. Instead, there are only four such holes on the card and even then, the houses on holes 4 and 5 and the clubhouse and accommodation units on holes 17 and 18 are set well back from the golfing action. For the majority of the round, you play in near isolation through woodland and wetland areas, with some very interesting changes in elevation encountered along the way. The 1st skirts Castle Hume Lough before the routing rises into the forest for three holes then back out again to the par three 5th, where an all carry tee shot is required across a sea of reeds to a peninsula green on the edge of the same lake. So far so good, it’s all been very pleasant and enjoyable. What happens next is totally unexpected: a substantial climb to the 6th hole were the fairway is laid out on a long ridge high above the resort on a long strip separating Castle Hume Lough from Lower Lough Erne. I thought it was a terrific par five hole, as are all the three-shot holes on the layout, in fact. The remainder of the course is now set out on this part of the property, with fairways tumbling across a heavily contoured landscape. Hole 7 swoops down to the water’s edge before the very tough 8th rises up again, doglegging left to the green. It’s followed by another wonderful par five which skirts a beautiful inlet on its way to an elevated green before you arrive at the signature hole on the layout. Some may criticise the 10th as it’s such a c ontrived short par four but you really have to marvel at what it must have taken to manufacture this spectacular hole on the edge of Lower Lough Erne. The routing then moves inland, highlighted by brilliant par fives at holes 14 and 16: the green on the former is protected by wetlands to the right and enormous bunkers to the left of the putting surface whilst the green on the latter is backed by half a dozen huge sand pits. The final two holes are then played out along the west shore of Castle Hume Lough, culminating in the par three closer which features water to the right and sand to the left of the home green. Forget about playing a typical parkland course when you visit here because the terrain is so varied. It’s also easy to see that no expense was spared during construction, evidenced by the enormous size of the greens and surrounding bunkers. I was surprised to learn that many peak time summer green fees can be had for fifty quid, which is less than half the price that would be charged if this course was located elsewhere in the UK. It’s not cheap, I know, but for the quality of the product on offer at a course currently ranked within the GB&I Top 100 , it’s a real bargain and golfers who choose to play nearby coastal courses should really consider it worth their while to take a break from their links exploits to try out this bold and brash Enniskillen beauty. Lough Erne. I was excited by this prospect, and the resort is lovely. Classy rooms and everything befitting a resort that has hosted the G8 summit. The golf course disappointed hugely. Strictly for buggy users, very American, some very odd routing of holes, tedious buggy pathways around greens. Some long walks green to next tee, bunkers in front of greens, [a bete noire of mine], some up turned saucer greens, too many big pointless bunkers, no signage or benches on tees. All rather soulless. Sorry, Nick, nothing personal! i would agree with most of the comments below. Its a beautiful piece of land but course is disappointing. Service is first class. Played a pretty much deserted course in May 2011 this year. Some great holes but quite a few average ones and after the round felt Sir Nick’s school report should rear ‘Could do better’. Definitely worth a visit but don’t believe the hype. This guy clearly doesn't have a clue. One of the finest golf course's in Ireland. I have played the majority of the top golf courses in Ireland. In my opinion this course is not one of the finest and no where near the top of the list. I have to agree with Billy. To say this course is no where near one of the top courses in Ireland is complete nonsense. Clearly it is very difficult to compare Lough Erne with the likes of Royal Portrush & RCD, however in mine and most other peoples opinion it would be in the top 3 parkland courses in Ireland. Nick, I would have respected your comments until you included Rathsallagh as a fine parkland course in Ireland. I think the natural beauty of Lough Erne has to be taken into consideration instead of the Bulldozer approach. Lough Erne is definitely worth a visit. Tomic. The reason I include Rathsallagh is simply that I believe it is the most natural modern parkland in Ireland, with little or no artifical earth movement having been done, few trees planted. It is as fine a tract of land for parkland golf as you will find. Thanks to everyone for their responses to this review. I'd be grateful if we could now give the original Lough Erne reviewer a break. Clearly Nick Faldo’s course divides opinion, as do so many other golf courses across the world. Is a lakeside course a legitimate description for a tract of golfing real estate or is it merely one of the many marketing ploys new projects indulge in? As I drove away from Lough Erne this was a question that nagged me the whole way down up N3 on my journey to Enniskillen. In the last few years we have been exposed to the concept of an "inland links", which barring one or two examples, is marketing speak for agricultural land that is neither suitable for a golf course nor possessing of any features that remotely give resemblance to parkland or heathland. Lakeside courses are very much in the minority in golfing speak, Killarney (Killeen & Mahoney's Point) Concra Wood and Tulfarris are legitimate Irish examples that are well and truly played along the shores of their respective bodies of water and of course the veritable Loch Lomond, which I have not yet played but annually enjoy its exposure on television, needs no introduction. As said all of the above are firstly strong, well designed tracks which except for Concra Wood (which I am certain it will in the near future) have all hosted numerous elite events, but secondly and in my opinion most importantly in their case are completely true to their description as a "lakeside" course this makes them uniquely part of a select brotherhood of courses of this nature. As you can gather so far I am a traditionalist and such it was with a certain amount of trepidation that I approached Lough Erne fearful that it may be an "imposter" claiming to be something it was not. All I can say is that my fears were well and truly allayed by the time I placed my tee peg in the ground on the opening hole. The view from the first tee is nothing short of spectacular, if you span 360 you can see the first green framed by tall verdant green pines to the left and the lurking waters of the lake to the right and as you move your head around it only gets better the 16th, 17th and 18th are in view along the shore of the lake offering the golfer a glimpse of what lies ahead and then onto the resplendent hotel which seems to blend seamlessly into its surroundings.The first five holes rank right up there with some of the finest opening salvos this author has ever experienced. One and two are great short par 4's offering birdies to ease the golfer into his round but at the same time the careless player can easily be two over or worse standing on the third tee. The two par 3's are very strong, with the 5th in particular an all or nothing shot played over an inlet of the lake, while the 4th is an inviting par 5 which can be reached in two if one's drive finds the fairway. The stretch of holes 6 through 13 contain a couple of good holes namely the 8th and 9th, the former a bull of a par 4 requiring a long drive and a precise second shot to find a heavily contoured putting surface( a hallmark of Sir Nick’s design here). While the 9th is a par 5 where the approach is played over a marshy inlet of Lough Erne. However it is the other holes in this section of this course with which I find fault with, for too many of the “filler” type hole are present. I can always understand that not every hole on a golf course will take one’s breath away and that certain sites give rise to constraints of all types, but I believe if any of the golden age architects were given the task of designing a group of holes through this section of the course I am sure they would muster up something more interesting as opposed to the “bomb and Gouge” nature of 11 and 12, the sheer blandness of the 13th the production line style 200 yard+ uphill par 3, the gimmicky type 10th where too blatant an attempt to construct a signature hole has resulted in a 4 iron and a chip hole, while the 6th may be one of the poorest constructed par 5’s I have ever witnessed, lacking any real imagination and asking little or no question of the player. However poor this middle section of the course is, the final 5 holes go along way to making up for its shortcomings. At every hole danger lurks, whether it be the lake, deep bunkers or the devilishly sloping 15th green. The 16th demands a power fade off the left bunker and presents a genuine opportunity to pick up a stroke if the player is up to the task of a terrifying shot to a green guarded by the lake left, bunkers long and a marsh to the right, a tremendous par 5. The 17th is a delightful 3 iron and wedge hole which call for precision as opposed to length and the green can throw up some very interesting pin placements as it sits tantalisingly close to the waters edge. Before I continue I must admit I am not a huge fan of courses that finish with a par 3, I feel that they don’t really present the golfer with a genuine chance to improve his score like a reachable par 5 or short par 4 would and they merely serve as a means to an end meaning no matter what score he has shot he can off slightly happier and in a matchplay scenario the hole can be over after the tee shots leading to a state of anti climax for the spectator. The 18th at Lough Erne is a tremendous par 3, no doubt one of the best around, but as you can see its placement in the round really does noting to excite me. The resort opened to great fanfare, Nick Faldo's first design in Ireland, Rory McIlroy as touring pro, Luxurious 5 star hotel, authentic Thai Spa, a huge residential development, the list goes on. Again I reiterate I am a traditionalist and a purist unless the golf course stacks up, all else for me is irrelevant (many places of this nature take note). Does the golf course succeed on this point? Lough Erne is a “good” golf course I stop short of saying great as I feel the middle holes are holding it back, maybe over time things will change as this baby is still only an infant in the big bad world of golf. I am drawn to compare it to the Killeen course at Killarney (nearly 100 years its senior) and if offered one or the other in the morning I would still take Killarney, but its close. Lough Erne has the wow factor and to the untrained eye the loughside holes do seem “amazing” but as a golf course Killeen is ever more the academic’s choice. 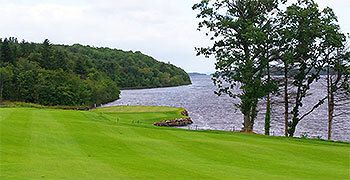 I still say most certainly go and play Lough Erne and see if you agree with me, it is most certainly well worth a visit! Very nice review although I find myself disagreeing with many of the author's views. Namely (aside from the walk to the tee), I believe the 6th to be one of the finest par-5's in the country, playing along a ridgetop to a skyline green in the distance. 7 is a let down and 8 and 9 are weak because they offer few options to the lesser player. Excellent course though and well written words above. One of the best golf courses I've stood on, or am likely to stand on.Played here in early March as a group of 8, and everyone came away raving about the course.The staff were brlliant, couldn't have made us more welcoming.The greens were tremendously consistent, and more importantly for me, they were fair. A true putt stayed true.The 18th hole is a bit of a let down, just a big standard medium length par 3, but almost every hole preceeding it was immense, in particular, holes from 4-14. I'd advise anyone to get your scoring underway early, as the back nine is a bit tighter.The views of the loughs are simply amazing.Lastly I'd recommend a buggy for two reasons. I've heard that rounds of 5+ hours like we had, are common. Also, the walk from the 5th green to the 6th tee must be about 350m, all uphill. 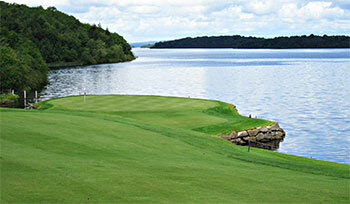 Had the pleasure of playing Lough Erne twice in September a few days after Padraig and Rory officially opened it. I had viewed the website and read the press releases before I went and I can say that you can definitely believe the hype, the course and hotel are superb.The starting holes are almost Woburn-esque set within a small wood then it’s up the hill to the 6th tee. It here you start to see the beauty of the Lough and the surrounding area. There are no weak holes but the stand out hole is the 10th with its green jutting out into the Lough. The green is drivable for the longish hitters but fraught with danger, take the sensible option and lay up and you’ll still end up needing a precise shot to hit the green. My only slight criticism is that a couple of the par 3’s are only average but the strong collection of par 4’s and 5’s more than make up for that. It’s hard to write about the golf course without mentioning the resort and hotel. The service by all the staff is truly 5 star, everyone seems to have time to ask how you are or to offer help, nothing is too much trouble.